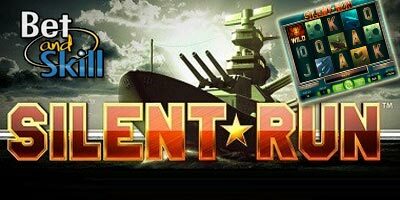 Silent Run takes you into the terrifying world of WW2 submarines and with its awesome graphical interface, authentic sounds and a cracking exclusive bonus game, this slot is most definitely worth a try! Try the game below for free on our site now and read more about Silent Run Slot. Silent Run™ is a 5-reel, 3-row, 25 fixed bet line video slot. The game features a Wild symbol, an Echo Bonus symbol that activates the bonus game, and an Echo Wild symbol which searches for hidden Wild symbols. Wild symbols substitute for all symbols except Echo Bonus and Echo Wild symbols. The Echo Wild symbol can only appear on reel 3. When an Echo Wild symbol appears anywhere on reel 3 it activates the Echo Wild feature. The symbol sends out 3 sonar signals and randomly substitutes symbols appearing anywhere on the reels into additional Wilds. Up to 14 symbols can turn into Wilds, including the Echo Wild symbol. The Echo Bonus symbol can only appear on reel 3. An Echo Bonus symbol appearing anywhere on reel 3 activates the Bonus Game. The symbol sends out 3 sonar signals, searching the reel area for hidden torpedoes. It will always find a random number between 2 and 5 torpedoes. The number of torpedoes found determines the number of torpedoes in the Bonus Game. Choose an enemy ship, take aim and fire your torpedoes to reveal your win. One of the ships is the Premium Ship so if you hit it, your win will be even bigger! Each ship you torpedo displays a different win amount. Your win is multiplied by a multiplier that is attached to each torpedo that increases after every hit until your torpedoes have run out. The multiplier to be used for each torpedo can be found in the mutiplier panel at the bottom of the screen. The multipliers are x1, x2, x3, x5 and x10. Pick a ship and fire your torpedo! The Bonus Game ends when all of the torpedoes have been fired. The maximum single win in the Bonus Game is 250000 coins while the maximum total win in the Bonus Game is 256600 coins. The coin wins in the Bonus Game are proportional to the bet level in the round that activated the Bonus Game. "Silent Run video slot * How To Play * Demo * Free Spins"